This masterfully crafted English commode features a stunning array of rare and contrasting woods to create delicately scrolled marquetry decorations. 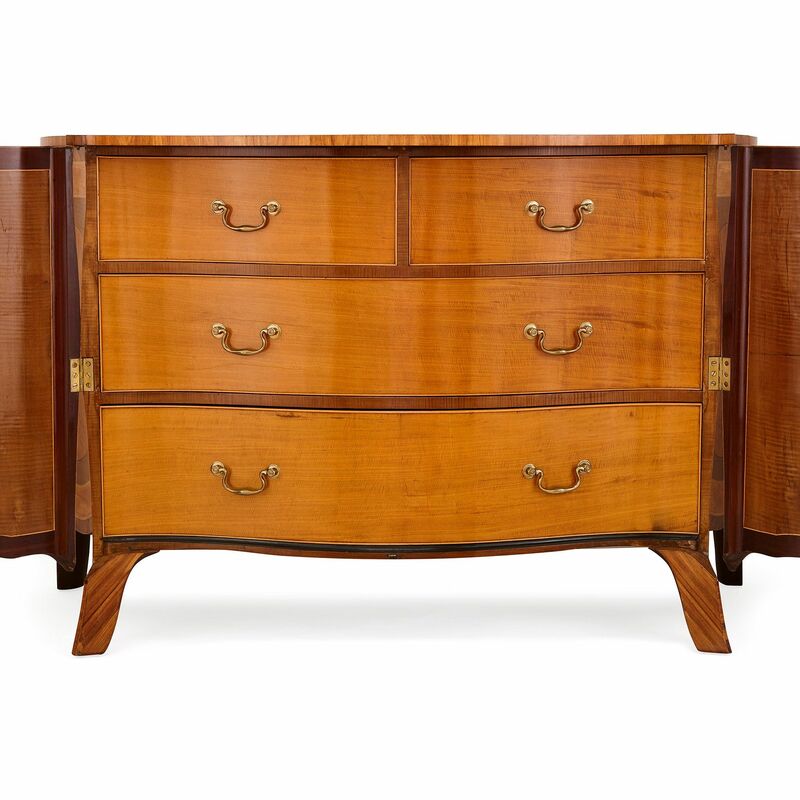 The commode is of rectangular form with bombé shaped front and sides, and is crafted from mahogany, satinwood, burlwood and other stained and precious woods. 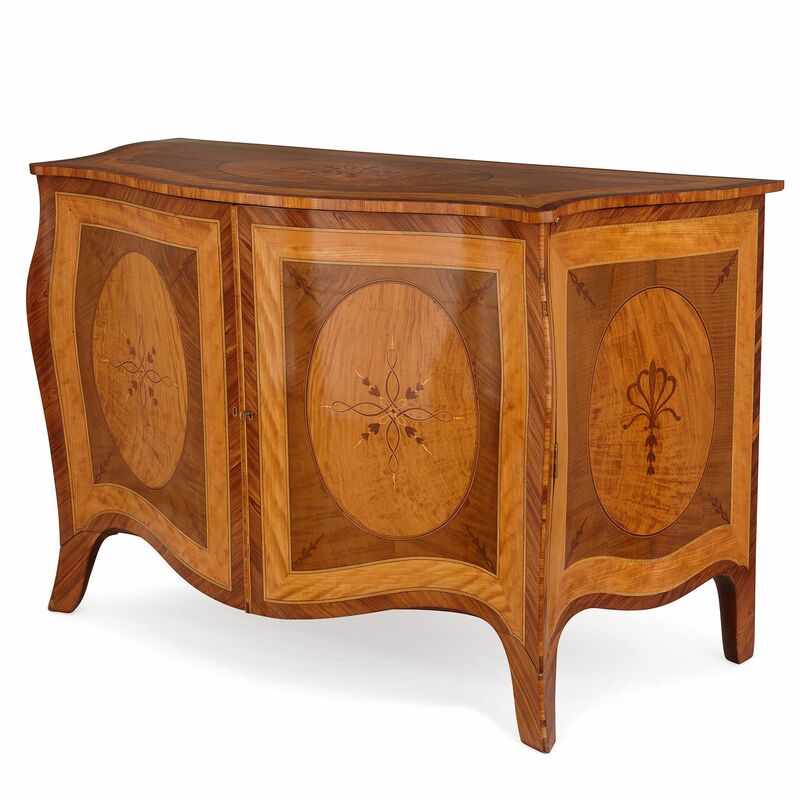 The commode features a top with curved edges and a central oval marquetry panel of leaves and scrolls in a star form. Around the central panel there are inlaid bands of contrasting woods. 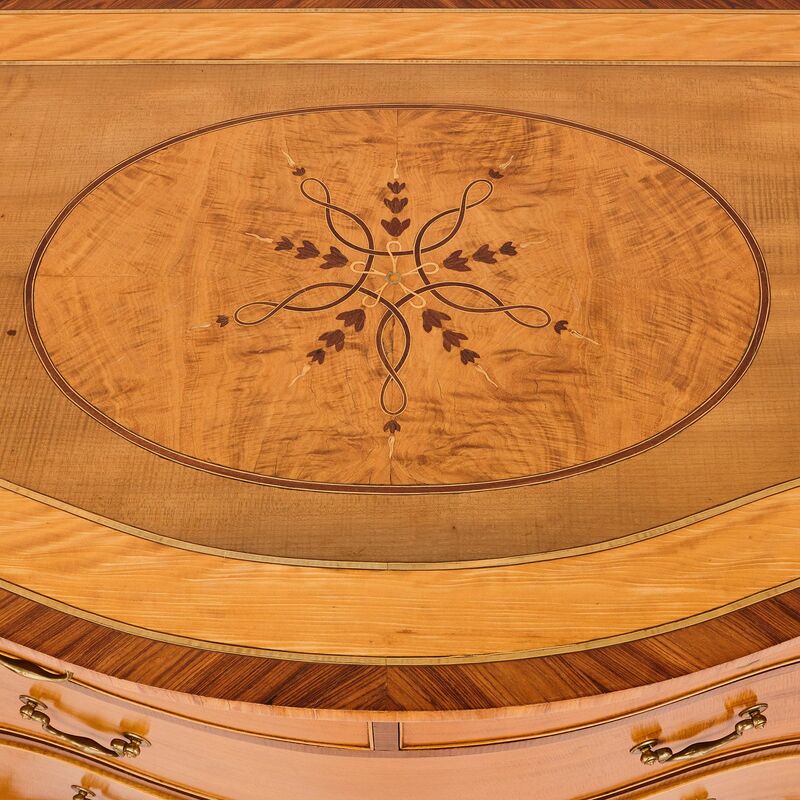 The commode is fronted with two curved, bombé doors, which are decorated with rectangular inlays of contrasting woods, each framing a further central oval marquetry panel bearing the same scroll and leaf design as appears on the top. The doors open to reveal four interior drawers - two half-width, upper drawers and two full-width lower drawers. 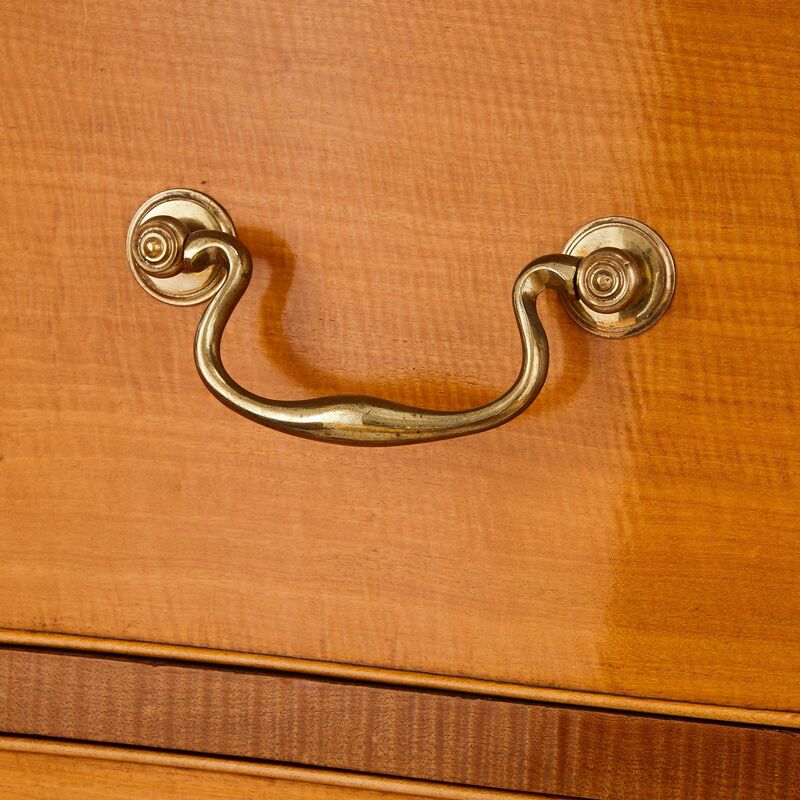 The drawers each bear simple, brass handles. 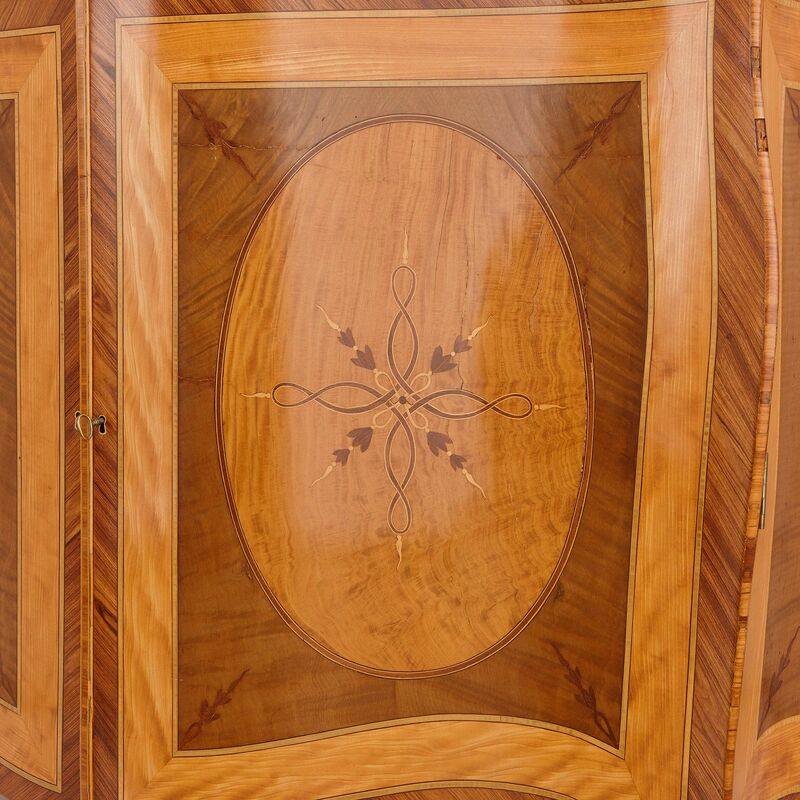 The sides of the commode are decorated with framed marquetry inlays of contrasting woods around a central oval panel, with foliate tassel-form marquetry detailing. The commode is set on four, short, curved block feet. The commode is firmly attributed to Pierre Langlois (English, active 1754-1781), a French-born cabinetmaker who operated a leading London-based workshop. His pieces can now be found in the Royal Collection and museums internationally. The commode shares features with documented commodes by Langlois including the bombé serpentine form, shaped apron and double doors. Formerly in the collection of the Earls of Carnarvon, Highclere Castle, Hampshire. It is thought that this commode was commissioned by Henry Herbert (1741-1811), 1st Earl of Carnarvon, together with a large armoire secretaire. The armoire, which is also attributed to Pierre Langlois, still resides at Highclere Castle, which has been home to the Earls of Carnarvon since 1769, when Henry Herbert inherited it from his uncle, the Honourable Royal Sawyer Herbert. Highclere is more well-known in recent times for being the setting of the BBC television series Downton Abbey. Subsequently with Partridge Fine Arts, later with Hotspur Antiques, and sold to a private Swiss collection in 1988. 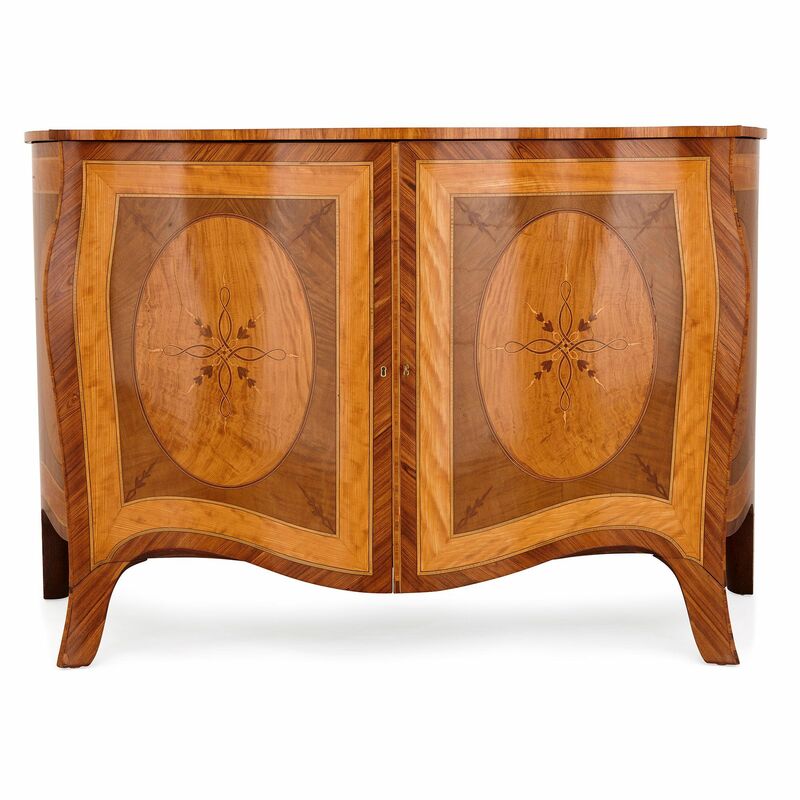 This elegant marquetry commode can be firmly attributed to the French born cabinet-maker Pierre Langlois, based on a number of comparable commodes discussed and illustrated in P. Thornton and W. Rieder, 'Pierre Langlois, Ebéniste', Parts I-V, Connoisseur, December 1971, February, March, April & May 1972, pp. 105-112, 178, 283-88.